IngredientsCows' Milk, Salt, Rennet, Dairy Cultures (Milk). There has always been a degree of uncertainty about the evolution of Stilton Cheese, but thanks to extensive research we now have a clearer knowledge of the origins and how Stilton Cheese evolved. Texts from the 19th and 20th Century suggest Stilton cheese has never been made in the village of Stilton, but was first sold here. One theory is that a lady called Frances Pawlett, a renowned cheesemaker from Wymondham, near Melton Mowbray in Leicestershire supplied blue veined cheese to Cooper Thornhill, the landlord of the Bell Inn in the village of Stilton in the 1740s. There has also been evidence to suggest that a harder, creamy cheese was being made and sold in and around the village of Stilton during the 17th and 18th centuries. Either way, it is clear that the origins of Stilton can be traced back to the Melton Mowbray area. Such was the popularity of Stilton that others in the area started to produce cheeses similar in style and in 1910, the producers had the foresight to lay down methods known today as Protected Designation of Origin (PDO). Amongst other things, the PDO specifies that the cheese has to be made with pasteurised milk within the counties of Nottinghamshire, Leicestershire and Derbyshire. 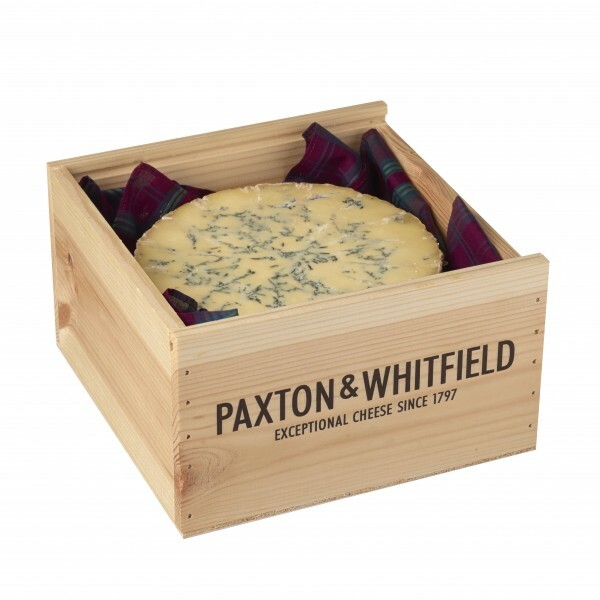 Paxton & Whitfield Stilton is made by Cropwell Bishop in Nottinghamshire and comprises cheeses that have been graded and chosen to meet the flavour and texture profiles specified by us. The milk used to make Stilton is a blend of morning and evening milk to which starter culture, rennet and blue mould culture is added. Once curds have formed, the whey is drained and the curds are hand ladled from the vat to the 'table' where they settle overnight. The following day, the curds are milled, salted and transferred by hand into cylindrical moulds. After a week when the cheeses have started to develop, they are taken out of the moulds and the rind is smoothed down. They remain in the ripening room for a further four weeks before they are pierced with stainless steel needles to encourage air to reach the interior of the cheese to spread the growth of the characteristic blue veining. Paxton & Whitfield cheese is then matured to approximately twelve weeks before arriving to our shops to be sold. The texture is creamy and the flavour mellow, with a buttery richness that melts in the mouth. Stilton in prime condition has a grey, wrinkly crust and the inside should be creamy yellow with an even spread of blue-green veins. The strength of the flavour should not be overpowering, but have a pleasant, herby tang. Our P&W Vintage Port is a perfect match for Stilton.